My plan changed a bit on this one. I had originally planned on using an old pattern from the stash. I decided it was too boring of a pattern for my fabulous flannel, though, so I picked up Simplicity 2481 when Joann’s had it on sale for $ .99. Even a cheapskate like me can swing that. I was worried about fit on these because the pattern is unisex, so I spent extra time checking the tissue and altering as needed. I cut a straight large, but I shortened the sleeves, top, and pants (7″!) and that worked out really well. I also did a lot of basting and trying on at each step of construction, and it paid off. The rise on the pants wound up being too long, so I took off 2″ at the waist; I probably could have taken off another inch, but I decided to see how they wear first. I can always remove more later if needed. Cutting these out was tricky; I wound up not having enough of the pink pig flannel, so I dug through the stash and found a dark pink flannel that matched the pigs nearly perfectly. (When I bought the pig flannel, was my plan to make shorts pajamas? The fabric has been in my stash for several years at least, so I have no idea.) And I had to seam the front and back down the middle, rather than cutting on the fold. On the plus side, there’s very little left of the two fabrics I used, so there’s a bit more room in the sewing room closet now. The only changes I made in the construction were to do flat felled seams on the most noticeable seams and to bind the neck edge and sleeves with a quilt-type binding rather than using bias tape on the neck and making narrow hems on the sleeves. ‘Cause if you’re gonna use two coordinating fabrics, you gotta bind one with the other, right? As for the sewing machine miracle, I still can’t quite believe it. I tipped the machine over the other day to get the model number, and realized when I tested it later that there was less resistance. Okay, so then what happens if I tip it over some more? PROBLEM SOLVED. Obviously, I must have dislodged whatever was jamming it, and it works fine for the moment. Who knows how long it will stay that way, but I’m so happy to be sewing again! The dead sewing machine has risen to sew again! Happy Monday, everybody. My week has gotten off to a productive start with some chores around the house and taking my partner’s van in for service this morning. I’m trying to get outside more to enjoy the mild fall weather while we have it, so I’m planning on a walk this afternoon. Friday was partner’s birthday. and I wanted to sew him something special. The initial plan was to make him a cycling jacket, as he’d admired this one at Universal Cycles and mentioned how great it would be in wool. He nixed that idea, though, as more fuss than he thought I should put into his birthday, so I made him a bike mascot for his new recumbent instead. The pattern was originally meant for making a doorstop, but I printed it out at 1/3 size to make about a 3″ tall mascot of wool felt. It’s mostly hand-sewn, though I did get frustrated about halfway through sewing the body and sewed the main seam with my machine. I was trying to backstitch it for a secure seam, but the black embroidery floss just sank into the wool and I couldn’t tell where one stitch ended and the next began. And you can’t see much of it in this picture, but I sewed two strips of felt into the side seams; they overlap at the back of the post and secure the cat with Velcro. I have nothing but respect for people who make tiny, precise little dolls and stuffed toys because, boy, that is SO not my thing. I named this mascot “Wonky Cat” in my head as I was working on it (apologies to Elton John and also to anyone who happens to acquire an unfortunate earworm as a result of this sentence) because everything about it is a little bit off and screwy. And that’s AFTER much seam ripping and re-sewing. The combination of bad eyesight, sewing tiny little things, and last week’s sky-high anxiety levels does not make for the best sewing results. Still, I like how it came out and so did partner. Wonky Cat was accompanied by chocolate cupcakes with chocolate frosting and excellent Indian food from the new restaurant down the road from our house. Nothing fancy there, just a simple, delicious cake for the chocolate lover in the house. The recipe is here; I made a quarter recipe, which yielded 7 cupcakes, a perfect number for the two of us. In other sewing news, I finally finished my pajama top yesterday, but the pants are currently stalled at about 3/4 finished. I was sewing the crotch seam when my sewing machine just stalled. I unthreaded it and cleaned and oiled it, but there must be something jamming it deep inside the machine–it will sew, if you floor it, but there’s way too much resistance at the same point on every stitch. Very, very discouraging. Depression and anxiety are hanging over my head these days, and sewing is what I’ve been relying on to keep my spirits up. And I really can’t spare the cash to take the machine in for service. So I’m researching to see if I can try to fix it myself. In the meantime, I’ve got some hand sewing to do, and I spent some time on Saturday night cutting new pattern pieces from the jumper I’m restyling for my next FESA project. Another tricky project, as I came to the conclusion that I needed to cut the bodice from one pattern and the skirt from another. I swear, for my next project I’m going to make something that I actually have enough fabric for; I can’t remember the last time that happened. Have an excellent day, folks. First FESA Project Finally Done! 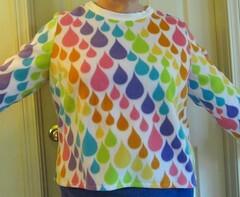 I finally finished the fleece cycling jersey for my honey yesterday! The pattern is Jalie 2216. I first made this pattern a couple of years ago in a bright orange sport knit; it was a bit of a nerve-racking experience, as I haven’t sewn much with knits, I’d never used a Jalie pattern before, and I rarely sew for other people. It was a challenge, but I did a muslin in a cheap knit fabric first, and that was a big help in getting the fit right, and also clarifying what he was looking for in a cycling jersey. A problem that I’ve had in sewing for non-sewers is that they tend to come up with “it would be great if you could . . . ” ideas when it’s too late in the process to accommodate them! (It occurs to me as I write this that he’s told me in the past how annoying that can be with his software clients at work. 😉 ) He wound up pretty happy with the orange jersey, though, and I used what I’d learned doing that to make the fleece one. The last version was modified to have a full-length zip, but we stuck to the half-zip for this one. We changed the pockets a bit, though, and I changed the sleeves to make them full-length, with elastic at the wrists. I’m not sure what I did wrong–I started this thing almost a year ago, so my memory is a bit hazy–but they turned out not nearly roomy enough (and of course I didn’t discover this until they’d been sewn). So what to do? Since the tightness started at the underarm, I decided to insert a long strip of fabric that would extend into an underarm gusset ending 3″ below the shoulder. I used one of his other fleece pullovers as a guide for how much to add. A big help in this process was the realization that I didn’t have to actually unpick the seams to insert the gusset; since the seam allowances were only 1/4″, I was able to just cut them off, then add another 1/2″ to the insert to make up for the loss. Whew! — When sewing for other people, talk a lot about what the recipient expects and wants in the item. This guy’s been cycling his whole life, so he has some opinions about cycling gear. So what features does he like in the jerseys he’s worn? What doesn’t he like? This actually was the source of the project, as he had plenty of fleece pullovers and cycling jerseys, but hadn’t been able to find a jersey made out of fleece. — Have the recipient try on the item at several stages of construction, if possible. Baste, try on, discuss, repeat. — Double-check by comparing the item to similar pieces that fit well. I wish I had compared my sleeve pattern piece to his other clothes before cutting it out! I’m glad to have this done–next up is my PJs! I’ve also got an idea cooking in the back of my brain to make myself a vest with the leftovers from the jersey . . . . Many things happening today–bread dough rising, butter softening for cookie-making, laundry spinning. But I thought I’d share a few bits and pieces. First, the bread is from my new favorite bread recipe. I’ve really become a fan of Serious Eats recipes lately; they seem to be really well tested and much more reliable than those of most sites on the web. Like the Cook’s Illustrated people, they are food obsessives and they tend to get things right. That also means that their recipes are often a bit more labor-intensive than they probably need to be for us ordinary proles. And the bread recipe has a lot of “do X, then let rest 5 minutes” instructions, which I sometimes find annoying. So I sometimes ignore them, and the bread still turns out great. And I prefer whole wheat bread, so I sub whole wheat flour for some of the white flour, and the recipe still turns out great. And sometimes I have leftover whey sitting around, so I use that for some of the water, and the recipe still turns out great. This is my kind of recipe, is what I’m saying. Second, here is my first batch of Freecycle fabric! Now, none of these were the kind of fabric I’m looking for to make pants with, but I liked them and my generous donor was happy to get rid of them, so I’m counting this as a win. The red and the black floral are knits, and I pretty much live in knit tops, so those will get used. The solid black fabric was described to me as a wool-blend crepe, which isn’t something I’ve worked with before. It has a loose weave and is a bit see-through, so it will have to be lined; I’m pondering possible dresses to make with it. (It’s super wide and there are almost 5 yards of it, so I may actually get more than one project out of it.) The check is the real find, though; it’s a lovely wool-blend with stripes of black, turquoise, plum, and purple. That will become a jacket, possibly to go over the black crepe dress. Yay! Third, I’m thinking I’m going to need to make some exercise clothes soon. After years of inconsistent exercising, I decided last May to do my best to exercise an hour a day every day that I can manage it. Yes, it’s a lot, but it’s what needs to happen if I’m going to manage my health problems and slow down their progression. So that’s what I’ve been doing, with the very happy result that I’m shrinking out of my exercise clothes. And I’m very slowly working on the Couch to 5k program, which means I now need running clothes, too. The Big 4 pattern companies don’t seem to do much in the way of plus-size athletic clothes patterns, so who to go to? Kwik-Sew? If anybody has recommendations, I’d love to hear them! Voting Now Open on Burdastyle Sewing Contest! If you like the bag I made, I would SO appreciate a vote for it! Here’s the linky. Click on the “vote” tab; if you use the “view slideshow” option (upper left), my bag is entry #14. If you use “view gallery,” my bag is on the right side about halfway down the page (it’s the “Purple Francesca”). Voting is open 10/7-10/14; it appears that you only get one vote (so much for stuffing the ballot box). Well, I’m sorry to say that the green FESA blouse isn’t going to get finished. I haven’t thrown it out–hope springs eternal, don’t it?–but it just became clear it wasn’t going to work. It always takes me a while to give up on things, and this time it took until the blouse was finished except for the front bands. The project was trouble from the start. I had less of the green linen than I thought, so I decided to cut the neck and front bands from a lovely cream linen that I’ve been trying to find a home for. Then I tried on the blouse when the major seams were basted and discovered that, not only was this thing HUGE on me, but there was no way I could wear that fabric for any length of time–the itching would have driven me to murder in no time. 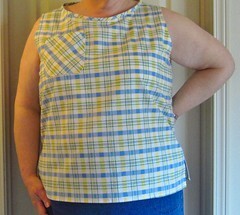 So I took the blouse in by many inches and cut a cotton muslin lining using the altered pieces as a pattern. I kept seeing problems during construction, but I kept going until I finally had to accept that the pattern just doesn’t work for me, at least in that fabric. 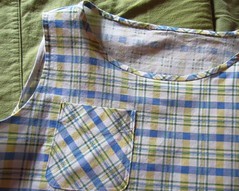 The lining reduced the drape of the linen, making the sleeves look lumpy. The length of the blouse hit me at exactly the wrong place. The overall effect was of a green linen cube–not a great look. I would like to try this one again someday, but it’s going to need a soft, drapey fabric and some serious alterations to the pattern. Not something I’m going to take on right now. So time to move on to my partner’s fleece cycling jersey, as the mornings are getting cool here and he’s once again wearing warmer clothes to ride. I’ll be happy to get that UFO out of my stash. On the plus side, I had a brainstorm this week and remembered Freecycle. My weight is creeping down–pound by hard-fought pound–and pretty soon I’m going to be out of pants I can wear. But I don’t have a lot of fabric that’s appropriate for pants, especially the Colette pattern I won. Well, why not look for some fabric on Freecycle? God knows there are always sewers with extra fabric they know they’ll never use. So I put up a request and should have some fabric to pick up next week. W00T! I’m so looking forward to this!